It’s that time of year again. Every year, between May 1 and October 31, beach goers will notice small areas of the beach marked with stakes in the sand, blocked off with orange tape. That can only mean one thing: it’s sea turtle nesting season. The beaches lining Sarasota’s coast have been a safe haven for loggerhead turtles for more than three decades. Heading the conservation efforts in Sarasota is Mote Marine Aquarium. It is thanks to the dedicated efforts of those at Mote who mark sea turtle nests in the sand, warning beach goers to respect and not disrupt the habitat in these delicate areas. A sea turtle sign at a beach access in Siesta Key. Crews from Mote Marine that include staff, interns, and volunteers, cover more than 35 miles of coastline on a daily basis between May and October, surveying the nest sites, while also taking action to deter predators, such as raccoon and fire ants, from destroying the nests. While people in our area tend to respect our turtle nests, the turtles do encounter obstacles once they hatch from their shells and dig their way out from under the sand. Once born, it is a straight sprint to the warm waters of the Gulf of Mexico. These small, freshly hatched turtles must overcome the perils of the night as they make their incredible journey from the nest, across the beach, and into the water. Sea gulls and other sea birds, crabs, and debris left by humans provide the biggest threats to these fragile creatures. 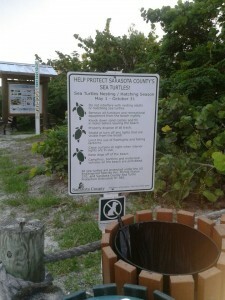 Mote, however, does provide a “Sea Turtle Hospital” to rescued turtles on our area beaches. In a safe, secure environment, visitors of Mote can observe rescued turtles and learn how Mote provides rehabilitation assistance for the baby turtles. What can you do to help protect the sea turtles? So the next time you’re at the beach and you see an area with caution tape and three small stakes in the ground, remember to observe from a distance. These are fragile creatures that are important to the our areas ecosystem and depend on all of us for their survival. For real estate information near Mote Marine Aquarium or near a beach where these turtles nest, please contact Jim Mulligan, 941-235-7474 or jim@suncoasteam.com.